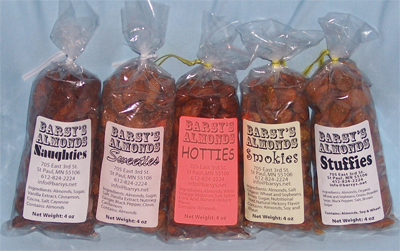 Barsy’s Almonds are made in small batches, using all natural ingredients with no added fats or preservatives. All of our almonds have a tender texture with a satisfying, irresistible “snap”. Barsy’s Almonds are great “keepers”, too - just keep the bag tightly shut and they’ll keep their crisp texture and flavor for weeks! What’s more, the recipes are completely vegan - absolutely no meat products, milk products or eggs. Sometimes called our “regular almonds”, these are the first almonds we sold and they’re still our most popular. They feature a deep hickory flavor that’s been called “vegan bacon”. The delightful crust is nutritional yeast, believe it or not. Wonderful with beer! Gluten Free! Not your ordinary cinnamon-roasted almond! They’re slightly sweet and a little exotic, subtly seasoned with traditional East-Indian spices. Eager customers tell us they remind them of Chai tea or pumpkin pie (without the pumpkin, of course!). Gluten Free! A chocolate almond for sophisticated palates. Rich, cocoa-covered almonds are made with cinnamon and a touch of cayenne to give them a decadent zing. They’re sweet, but not too sweet. Word has it they’re great with red wine. Gluten Free! Hot, tangy and a little provocative! There’s molasses for depth and sweetness, cayenne and chili for heat, curry spices for a rich taste and the tart tang of vinegar. Put them together and you get plenty of flavor and a definite kick. Classic stuffing flavor - with so much savory onion and sage, who needs a turkey! A satisfying, nutritious snack that’s also great in savory loaves, tossed on salads or added to steamed vegetables. All material copyright Barsy's Almonds, LLC.